Ask fellow campers about "Calef Lake Camping Area" and nearby attractions. 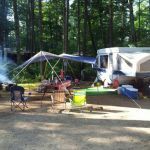 This campground is in a wooded area with lots of trees immediately off the roads on both sides of the winding roads to get to your campsite. Although the park advertises it has big rig access, this is a lie. The trees are so close to the winding road that big rigs cannot make it through without hitting some trees. I damage a window awning. It also only has 30 amp electrical hookups and not 50. I will not be back with my 40 foot motorhome. We camped at Calef Lake Camping Area in a Motorhome. Calef Lake was the first camp ground my family (2 adults, 4 kids) went to after purchasing our Travel Trailer. It was close to home and for that reason we figured it was a good place to try out camping. The people there are very friendly, both the staff and long term campers. The camp ground was very clean, with the site being raked down prior to our arrival. The second time we went, they put wild flowers in a plastic vase out on the fire pit. The beach is raked down daily and it is a nice sloping grade for young kids, with a dock the older kids like to play on. There were a lot of other kids on the camp grounds, giving a mix ages. The camp ground got really quiet at or just after 10pm. For services, the water pressure was good, we didn't have any problems with the electrical or sewer. There is a second pond for fishing, however be prepared to loose a lot of hooks as there are a lot of trees in the water. The overall camp ground is small but quaint. The kids enjoyed bike riding everyday. The camp ground is small enough that they passed the camp site every few minutes making it easier to keep track of them. The dumpers, while are on the way to the beach tend to fill up quick and have a foal odor in the immediate area. The roads can be tight to maneuver larger trailers through the park. All in all, my family really enjoyed the camp ground, and we plan on making regular trips back in the years to come. We camped at Calef Lake Camping Area in a Travel Trailer. We stayed here for a week while visiting our son and his family. The campsite we had was very nice size surrounded by trees. We did not like the excessive extra charges for visitors or visitor parking. The seasonal sites were somewhat of an eyesore. We did not use their facilities except for the restroom. I would have preferred a little better campground but all told it is not overly bad. We camped at Calef Lake Camping Area in a Travel Trailer. Excellent park, big sites many seasonal but well kept up. Roads a little narrow but one way so no problem. Very friendly and helpful staff. Easy to find. Would stay here again. We camped at Calef Lake Camping Area in a Travel Trailer. Excellent park, big sites many seasonal but well kept up. $$ showers. Roads a little narrow. Very friendly and helpful staff. Easy to find. Would stay here again. We camped at Calef Lake Camping Area in a Travel Trailer. Very shady/wooded. Nice creek and pleasant surroundings. But this was not our cup of tea. I didn't even try to point the Dish, and no cable. The lake beach was nice; we prefer a pool. 30A max, and the voltage (according to my EMS) was pretty iffy when the CG was full. It happens that two of the ladies in the office are very new to camping (thus clueless about a lot of questions). This park DEFINITELY needs a parking guide, as small, winding and hilly as the paths are. If you have a big rig, and are new at it, this campground will be a challenge. Overall, I think if you're looking for a retreat in the woods with no frills, particularly with a pop-up or other small rig, this may be the place for you. If you're looking for a KOA, go elsewhere. We camped at Calef Lake Camping Area in a Fifth Wheel. I chose this campground based solely on it's location, seeing as it was 15 minutes from where our family needed to be during the day that weekend. I didn't expect much based on their website, and I am very pleased that I took the chance. We had a great time. The kids enjoyed the nice sandy beach, and the small stream running almost directly by our site was a constant source of entertainment. On the down side, there are A LOT of seasonal sites, 90 according to the owner, and they definitely look like people who have been there for a while. Our site (red23) was fantastic, clean and perfect for what we were looking for. Note that the store/office closes early and she does not stay a minute late. We will go again. We camped at Calef Lake Camping Area in a Motorhome. Are you affiliated with Calef Lake Camping Area ?